The Ministry of Foreign Affairs headquarters on Asiatisk Plads - Christianshavn. The Ministry of Foreign Affairs is located on the isle of Amager - and on one of Copenhagen’s most beautiful spots - with a splendid view - for employees and visitors - over the harbour area and medieval Christianshavn. It was King Christian IV (1577-1648 - ruled Denmark and Norway 1588-1648) best known as the great builder of Copenhagen - who founded Christianshavn around 1617-22 - with its many canals - partly to protect the Royal Danish Navy and to increase trading with merchants from abroad. The Royal Navy Hospital nearby the Ministry was established in 1777 - and houses today the Naval Museum. The present buildings from 1978-1980 - of The Ministry of Foreign Affairs is situated on Asiatisk Plads (Asian Square) - which was the former warehouse quarters and quay for the previous global East Asiatic Company EAC/ØK - which was one of the largest shipping companies in the world - with trading activities between Asia and Africa - as well as sugar import from the Danish West Indies (Virgin Islands) - a past colony of Denmark in the Caribbean - and sold to the US in 1817 - for 25 million Dollars. 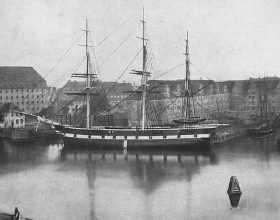 Asiatisk Plads and the Frigate "Havfruen" in 1880 at the East Asiatic Company's quay - where the present Foreign Ministry’s complex are located. Here ships unloaded their goods from the Far East and Africa. 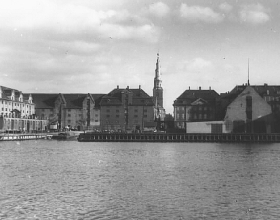 The quay at Asiatisk Plads in 1936 - with Eigtveds Warehouse to the left and the Church of Our Saviour at the back. The Church was built in 1689 with 150 steps twisting around the outside with a magnificent view over Christianshavn and the city. Beside the headquarters of The Ministry of Foreign Affairs lies the old 4-story Eigtveds Warehouse from 1750 - which was owned by East Asiatic Company - who used the warehouse facilities until 1976. The entire warehouse complex was then taken over by the central administration - who carefully renovated the magnificent old building and turned it into a modern conference centre for multi-ministerial purposes in 1982. 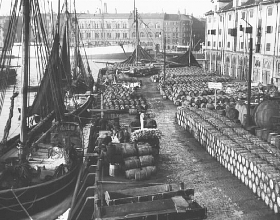 The harbour area around Eigtveds Warehouse from 1750 - with ships on the pier loading barrels in 1926. The warehouse was a 4-story high building and the dock facilities were in function until 1976. 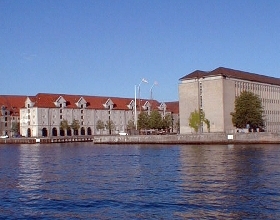 The present Eigtveds Warehouse beside the ministerial buildings was turned into a modern conference centre and well-designed reception facilities in 1982 - for the Foreign Ministry and the Central Administration. From the 17th century - Denmark has had close relations with foreign countries and especially with its Scandinavian neighbours - as a neutral state. The diplomatic connection was established through the Kings special Foreign department - which was a particular section in the central administration in Copenhagen. Around 1770 - the Foreign department was separated from the Chancellery premises - and named the Ministry of Foreign Affairs - with one minister and a handful of employees. After the introduction in 1849 - of the new Danish Constitution - and during the First World War the interest in foreign policy enhanced between the politicians at the Danish Rigsdag (Parliament). To achieve more influence on the international scene - a Foreign Policy Committee was create in 1923 - but during the Second World War - and occupation of the Danish Kingdom - the Ministry of Foreign Affairs had hardly any authority on the political arena like most other conquered countries. After the Second World War - and up to today - the Ministry of Foreign Affairs has contributed to form multilateral collaboration with organisations such as the UN - NATO - OECD - EU - WTO and many more - plus service the many embassies and overseas offices abroad under the jurisdiction of the head office in Copenhagen. 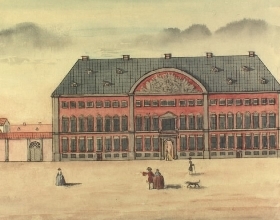 The Red Building called the Chancellery House was completed in 1721 - and was the first headquarter for the Danish Foreign Service until 1848. The building still exists and can bee seen beside Christiansborg Palace. 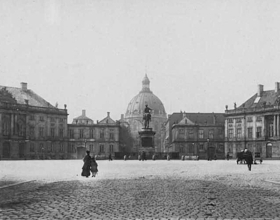 Amalienborg Palace in 1884 - where Christian VII's Palace to the left of King Frederik V's equestrian statue - was the address of the Foreign Ministry until 1898. The Marble Church at the back was not completed until 1894. In 1721 - the first Foreign Service had its headquarters in The Red Building (Den Røde bygning) until the end of the absolutism period in 1849. The impressive Red building can bee seen on the corner of Christiansborg Palace Square and Slotsholmsgade. Today the Red building houses The Ministry of Finance. 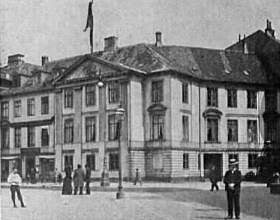 Det Harsdoffske Palæ (Harsdoffske Mansion) in 1898 - on Kongens Nytorv (The Kings Square) was the headquarters for the Foreign Ministry until 1923. Other prominent buildings around the square included the Royal Danish Theatre, Charlottenborg - the French Embassy - and and the fashionable Hotel d'Angleterre. From 1923 - the seat of the Danish Foreign Ministry was at Christiansborg Palace. 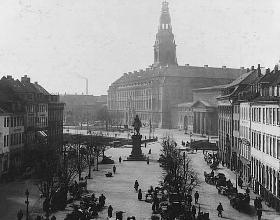 The picture is from 1924, with Christiansborg Palace at the back and Højbro Plads in front. In the middle of the square - the equestrian statue of Bishop Absalon - erected in 1902. Absalon was the founder of Copenhagen around 1167. In 1853 - the Ministry of Foreign Affairs moved to one of the mansions at Amalienborg Palace called Christian VII’s palace - and then later to Christian VIII's palace. In 1898 - the Foreign Ministry had to hand over their premises back to the Royal Family - and moved to new locations at Kongens Nytorv (The Kings New Square) into Det Harsdoffske Palæ - a huge mansion near Nyhavn. After a few years the Foreign Ministry ran out of space and in 1923 - and then move to Christiansborg Palace together with the Central Administration. The Foreign Ministry is located in picturesque surroundings at Christianshavn - where the two masts wooden cargo ketch named Skibladner II from 1897 - has a permanent place at the quay alongside Eigtveds Warehouse. Following a very turbulent period after the Second World War and with different addresses around in Copenhagen - as well as an explosive growth in staff and workload - the present government found it necessary to assemble the Ministry of Foreign Affairs under its own roof. In 1978 - the buildings at Asiatisk Plads were completed and inaugurated for used - and have since been the prime headquarters of the Foreign Danish Ministry. 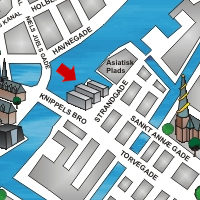 The Ministry of Foreign Affairs is located on the isle of Amager - and nearby the historic Canals of Christianshavn. This Site will be updated and continued!